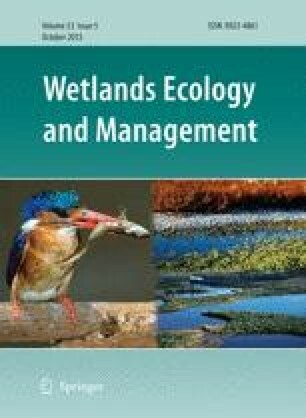 Freshwater wetlands provide a range of ecosystem services, one of which is climate regulation. They are known to contain large pools of carbon (C) that can be affected by land-use change. In New Zealand, only 10 % of the original freshwater wetlands remain due to conversion into agriculture. This study presents the first national estimation of C stocks in freshwater wetlands based on the compilation of soil carbon data from 126 sites across the country. We estimated C stocks for two soil sample types (mineral and organic) in different classes of wetlands (fen, bog, swamp, marsh, pakihi and ephemeral), and extrapolated C stocks to national level using GIS. Bogs had high C content and low bulk densities, while ephemeral wetlands were the reverse. A regression between bulk density and C content showed a high influence of the soil type. Average C densities (average ± standard error) were 1,348 ± 184 t C ha−1 at full peat depth (average of 3.9 m) and 102 ± 5 t C ha−1 (0.3 m depth) for organic soils, and 121 ± 24 t C ha−1 (0.3 m depth) for mineral soils. At national level, C stocks were estimated at 11 ± 1 Mt (0.3 m depth) and 144 ± 17 Mt (full peat depth) in organic soils, and 23 ± 1 Mt (0.3 m depth) in mineral soils. Since European settlement, 146,000 ha of organic soils have been converted to agriculture, which could release between 0.5 and 2 Mt CO2 year−1, equivalent to 1–6 % of New Zealand’s total agricultural greenhouse gas emissions. This research was co-funded by the Ministry for Primary Industry and by Ministry of Business, Innovation and Employment (MBIE) core funding to Landcare Research and the Department of Conservation. The authors acknowledge Miko Kirschbaum and John Dymond for their valuable comments and Anne Austin for editing.